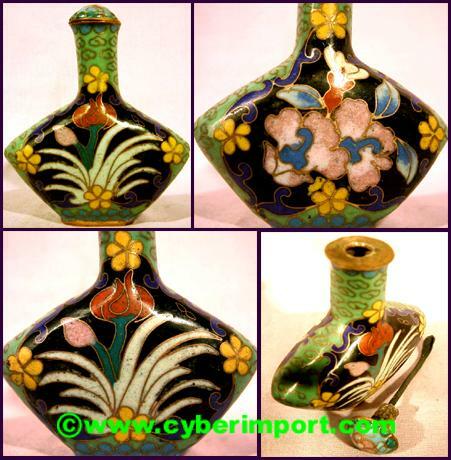 OUR ONLINE CATALOG and this cloisonne snuff bottle page serve as a cross-section of our China exports. Greater variety is available. Email us a photo example of what you seek. Export prices often change. All are re confirmed after your inquiry. You will be emailed a pro-forma invoice offer. 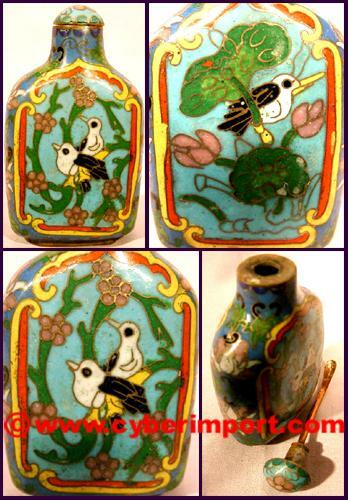 This snuff bottle is hand-crafted from genuine cloisonne with flat-machined wire in between inlays. Stopper with metal spoon. Wood display base. 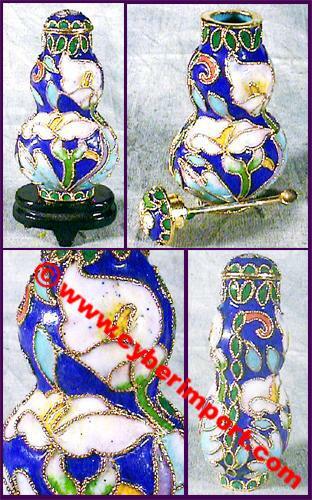 sbcl023-6 $1.97 50 42 1 1/2" x 3/4" x 2 1/2"
This snuff bottle is hand-crafted from genuine cloisonne with flat-machined wire in between inlays. 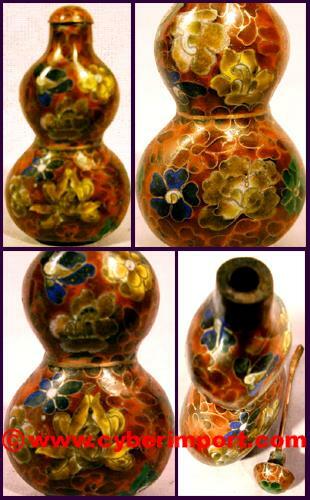 Stopper with metal spoon. Wood dispay base. 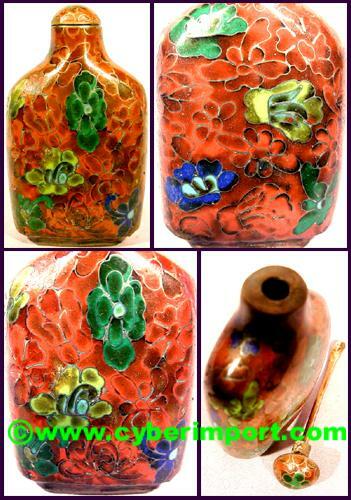 sbcl024-6 $1.80 50 44 1 1/2" x 7/8" x 2 1/2"
This snuff bottle is hand-crafted from genuine cloisonne with flat-machined wire in between inlays. 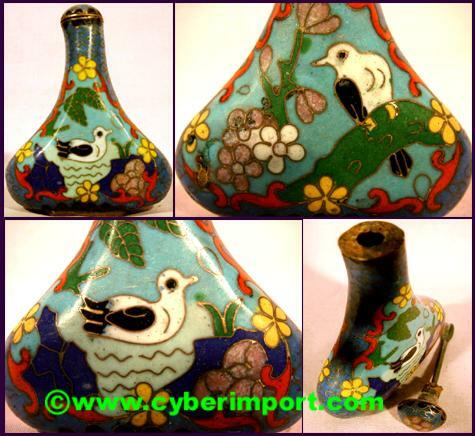 Done in an unusual antique look and appears old. Stopper with metal spoon. sbcl025 $4.17 40 50 2 1/4"x 3/4"x 2 7/8"
sbcl026 $4.67 40 52 1 3/4"x 3/4"x 3"
sbcl027 $4.17 40 46 2 1/4"x 7/8"x 2 3/4"
sbcl028 $4.67 40 46 2 3/8"x 3/4"x 2 7/8"
sbcl029 $3.33 40 52 1 3/4"x 3/4"x 3"
sbcl030 $4.67 40 48 1 5/8"x 3/4"x 2 7/8"
sbcl031 $4.17 40 50 1 1/2"x 5/8"x 2 7/8"
sbcl032 $4.17 40 46 2 3/8"x 3/4"x 2 7/8"
sbcl033 $4.17 40 54 1 3/4"x 1"x 3 1/4"
sbcl034 $4.17 40 40 2 1/4"x 3/4"x 2 5/8"
sbcl035 $2.33 50 26 1 3/8"x5/8"x2 3/4"
sbcl036 $2.33 50 24 1 1/2"x3/4"x2 3/8"
Cloisonne Art has been practiced by the Chinese since the Fourteenth Century. 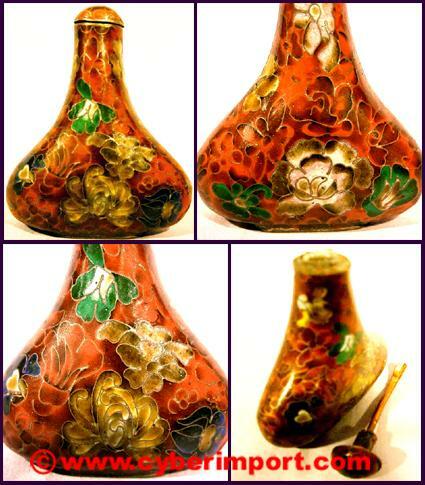 It involves multiple colors of enamel which are applied to the surface of a bronze or copper object. 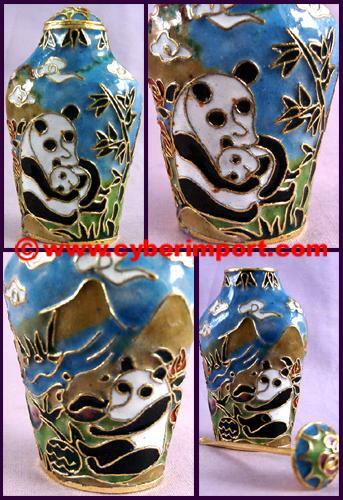 The piece is then fired to achieve its typical, bright colors. This procedure begins with precision work. Wire, either twisted or flat machined, is soldered to the surface to make a pattern. 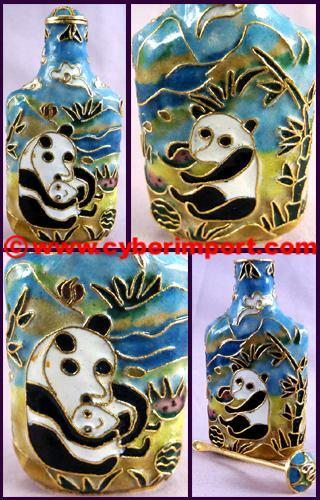 The spaces between the wire are then filled in with the enamel pastes for firing. This might be repeated numerous times until the proper glaze is achieved. 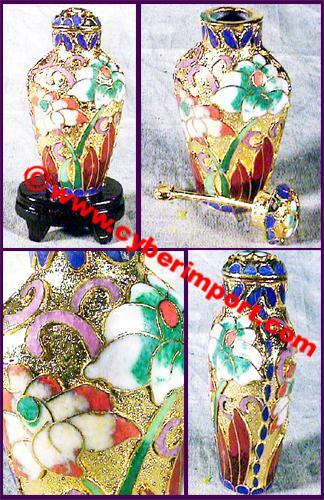 Truly a decorative fine art and sought out by appreciative collectors. 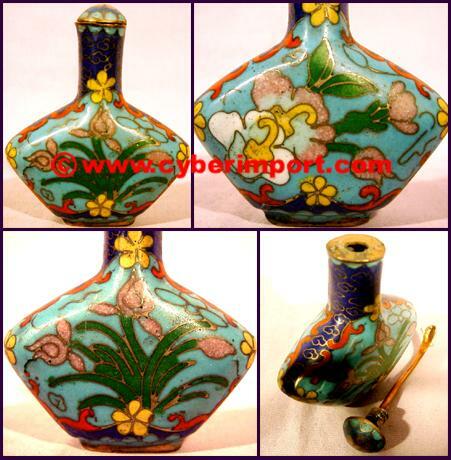 China Factory Minimum Quantity of these cloisonne snuff bottle items can be negotiated with factories. Dollar Amount is often more important to smaller factories than the quantity of each piece. 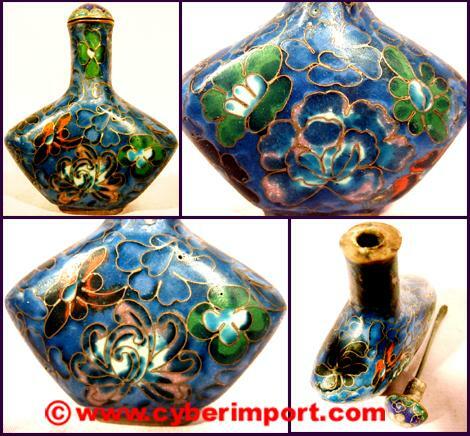 Minimum quantity often can be divided among several cloisonne snuff bottle or stock numbers. Please inquire with us about your specific needs for smaller quantities than those listed. Smaller quantity can result in a bit higher price. Ask us for a quote. 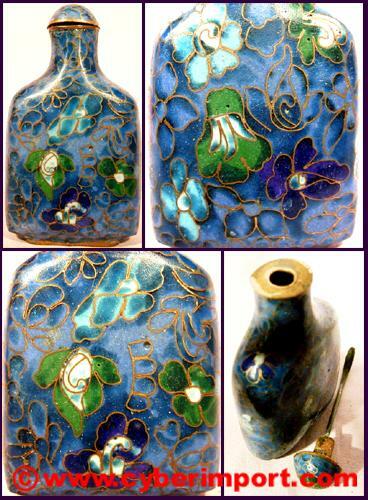 Custom Orders are possible with any of our cloisonne snuff bottle products. Send us a .jpg example of what you want. If we don't have it, we can get it.